Just days away from the referendum promoted by secessionist forces, Spanish police arrested over a dozen senior officials from the Generalitat and carried out over forty raids in the Catalan government’s headquarters. Social and political tensions have reached a new height as the unified state’s repressive machinery has been set in motion. Protests are being stepped up and political rhetoric is ever more aggressive. If the irresponsible actions of the political class that led to this institutional breakdown continues, deep social conflict will follow. This extreme situation was unthinkable less than a decade ago. 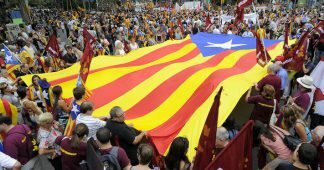 According to the Catalan public polling body, only 15% of Catalans wanted an independent state when the economic crisis broke out in September 2008. Six years later, that number was up to 48%. Given the entire population of Catalonia (7.5m), this would mean that close to 2.5 million Catalans switched in favor of independence in over just six years. Why? At least two major events have contributed to the tense relations between Catalonia and the rest of Spain. First, the Statute of Autonomy approved by Catalans in 2006 underwent several amendments by the Spanish constitutional court in 2010. While the real changes are often exaggerated by secessionists, the reckless attitude of the central government dynamited any possibilities for agreement. Second, the economic crisis triggered widespread political dissatisfaction with the functioning of Spanish democracy. The dire economic situation, unpopular austerity measures, and a series of large-scale corruption scandals affecting political elites, nourished the breeding ground for new movements and parties with a clear-cut enemy to blame. Some pointed to the banking and political elites. In Catalonia, the scapegoat became Spain itself. Following the victory of the centre-right Popular Party (PP) in the Spanish general election of November 2011, many turned to independence as an expression of dissatisfaction with the Spanish government. It did not take long for the Catalan Right to embrace secessionism for the first time in an attempt to capitalise on this growing sentiment. At the time, the nationalist coalition Convergencia i Unió (CiU) faced several corruption scandals and the political burden of managing the economic crisis. Conflict was served. A coalition of strange bedfellows from the left and right united by their vision of a new Catalan state initiated the so-called procés (process) to independence. Claiming to represent the will of the Catalan people (as a homogeneous group) against corrupt and unreformable Spain in an unmistakably populist manner, they promised to dedicate all efforts to the creation of the newest state in Europe. It has proved to be a complicated task. While the right to self-determination is a powerful moral tool, the international community reserves it for cases bolstered by human rights abuses. For a rich region with very high levels of self-government in one of Europe’s advanced democracies, building a case for independence is a tough enterprise. Especially so when the country in question ranks highly on all democracy and political and civil rights indexes. In spite of an adverse international scenario, the campaigning efforts in favour of independence have been persistent. Often, also manipulative. The main line of argument has been that of portraying Spain as an authoritarian state, hostile to Catalonia. While the Spanish state is far from perfect and the model of territorial administration (the State of Autonomies) is in serious need of revisiting, equating Spain to a dictatorship as if nothing had changed since Franco’s regime is straying from the truth, to put it mildly. Other arguments in favour of independence have revolved around a –rather questionable– fiscal plundering or historical reinterpretations dating back to 18th century monarchy wars. The debate, at times similar to the Brexit campaign, has been everything but a reasonable and informed discussion on the benefits and consequences of independence. For instance, the reiterated position expressed by EU officials about the potential exit of Catalonia from the EU in case of unilateral independence has been largely ignored if not deliberately misinterpreted. Paradoxically, the greatest ally of secessionism has been the Spanish premier and his cabinet. Hiding behind a legalist banner, the PP have been pursuing an ostrich strategy for years. Not only have they refused to engage in finding any political solution to a growing political problem, but they have also undertaken dubious subterranean operations to weaken secessionist forces. The growing shift to independence, not surprisingly, comprises a large dose of protest against an immobile national government. Regional elections were held in September 2015, nearly a year after the failed referendum attempt in 2014 (only participated in by pro-independence supporters). The results reflected a rather new stable equilibrium of preferences over the state’s territorial disposition. Half favoured independence. The other half, either a federal state (more regional autonomy without independence), or remaining an autonomous community (maintaining the status quo). The results did not grant the degree of legitimacy expected by the secessionist coalition to pursue their ambitions. Despite having a parliamentary majority, they failed to reach the 50% threshold. They were now trapped by the promise of staging a referendum on independence with no legitimacy to do so. Only through provoking a disproportionate reaction from the state to expose its repressive nature could they hope to win the necessary support for unilateral action. And that’s what they did. On September 6 and 7 the strategy materialised. Despite a majority of citizens rejecting unilateral action and with a minimal parliamentary majority, the secessionist coalition threw caution to the wind. In an irregular and speedy parliamentary procedure that by-passed the opposition, they approved illicit laws to hold a referendum and make its result binding. These laws were not only clearly at odds with the Spanish constitution, but also with the Catalan statute of autonomy approved in 2006. Unsurprisingly, the constitutional court declared such laws illegal within hours and the battle for the October 1 referendum that we are now witnessing commenced. Nobody knows what will happen on October 1. The state’s repressive machinery is in full motion, and Catalonia’s treasury and regional police have been seized. Not only have senior Catalan officials been arrested but the police have raided and confiscated all material concerning the referendum. More recently, Catalan police have received orders to seal off all polling stations. This full-scale intervention has provoked a large-scale public reaction against repression. The debate is now shifting from the right to secession and self-determination to the defence of freedom of expression. As it turns out, the Spanish government’s toughness-without-solution approach might push many Catalans to vote on Sunday. If there is anywhere to vote, that is. Whatever happens, the problem will not go away the day after. And it will be ever more complex. Between a central government that refuses to acknowledge an obvious political problem and a secessionist coalition that has proved reckless enough to operate outside the law to achieve its political objectives, the road to resolution will be long. Any solution will inevitably pass through dialogue, but dialogue is useless if neither side is willing to compromise. The enforcement of the law will solve nothing without addressing the peaceful mobilisation of the pro-independence Catalans.. Yet, operating outside of the law must meet a decisive judiciary response. So far, the irresponsibility of both sides has led to a political deadlock and social tensions. It is time to sit and talk before it is too late.